Enjoy a refreshing sleep and a comfortable awakening! This application will gently awaken you at the right time. ■Analyze your REM and non-REM sleep using the iPhone's accelerometer! ■REM sleep is generally classified as the period of light sleep, while non-REM sleep is the period of heavy sleep. ■Good Night's Sleep Alarm ensures that you are in a light sleep cycle before sounding the alarm, allowing for a natural and comfortable awakening. Each day, you can check how light or deep your sleep was and how many hours of sleep you got. You can then share your sleep graph through Twitter, Facebook or e-mail. ・Do not push the home or lock button and terminate the application when using the alarm. ・Always connect your charger to your phone when using the alarm. ・If the app does not accurately measure your sleep data, try adjusting the position of your phone. ※If you have any questions, please feel free to contact us at info+ios+zero+kaimin@support.a-tm.co.jp. ※Please be aware that we cannot reply to reviews written in the review section. 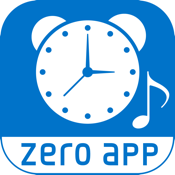 All of us on the ZeroApp team thank you for using our app! !